We are proud to present an authentic representation of the dog tags James “Bucky” Barnes, the The Winter Soldier. 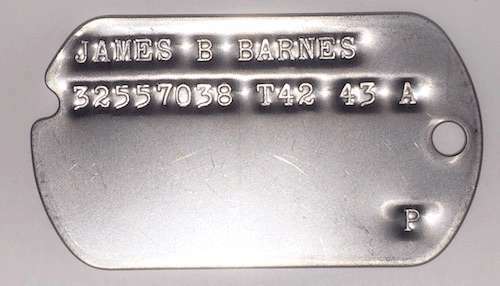 These are reproduction James B. Barnes dog tags as might have been worn by him. With the release of Captain America: The Winter Soldier we have received many orders for custom James “Bucky” Barnes dog tags, and to meet demand we have recreated a dog tag Bucky Barnes may have worn. 2 Dog Tags and a long and short chain set. For “Steve Rogers Captain America, the First Avenger Dog Tags” click here. OMG I LOVE MY TAGS!!! They are accurate to the T!! They came a few days late but it was well worth it! I now wear my Bucky’s dog tags EVERYWHERE AND THEY GO WELL WITH EVERYTHING! Good quality, accurate tags. They jingle a lot, but that’s to be expected with metal tags with no silencer on them. Thanks for the great review.. In the near future we will be offering WWII style silencers… Keep an eye out. What is the difference between the beaded chain and the original beaded chain? The beaded chain that comes standard is current manufacture to the same specifications of WWII. 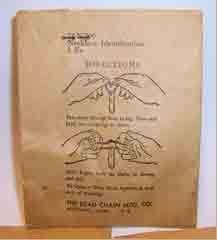 The original beaded chains I have were manufactured in 1944 and come in the original unopened package. So happy with the dog tags! 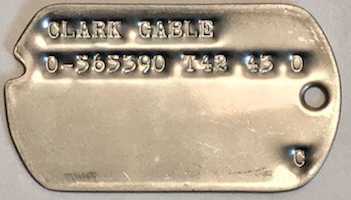 I am a really big fan of the character of Bucky, and the opportunity to get “authentic” recreations of what his dog tags would have been like was really exciting. They arrived quickly and I have been wearing them every chance I get; they really make me happy! My only suggestion would be to maybe find a way to mail them without putting tape on the dog tags directly (perhaps sandwich them under a piece of cardboard or another piece of paper first?). I know you don’t want them moving around in the envelope, but it was difficult to remove the tape from the tags without leaving adhesive on them, and it took a while to get all the little gummy bits off them. I ordered both the Steve Rogers and the Bucky Barnes tags to be delivered internationally (to the UK). I am thrilled to bits with the tags which are exactly what I wanted. They are perfect for cosplay and, as far as I know, these are the only historically and canonically accurate dog tags available. Thank you for the tags and thanks for the speedy delivery! I would definitely recommend both tags to all Cap/Bucky fans. You won’t find better! Arrived all the way to Australia in one piece! Looks great and feels authentic. The original chain is so sturdy and looks great. I have worn them every day since they arrived, I love my JBB dog tags so much I am considering buying the SGR ones to match. Thanks a bunch! These tags are awesome! I wear them all the time and everyone thinks they’re really cool! They seem so authentic and they’re a must-have for marvel and bucky fans! I love them! They’re awesome and in good quality! Exactly like the picture! I’m in love! Thanks! I love these dog tags. They are so legit looking and the quality is great. I’m glad I came across this website before purchasing elsewhere as other places/sellers aren’t this accurate. They do make a bit of noise when wearing them so instead of wearing both tags at once I wear one and keep one on my keys. I mean I can’t complain too much since I knew I was purchasing metal :) Thank you for making these!! This company is so great! I ordered two necklaces on Thursday, and they arrived by Saturday, and shipping was only $3.50! The necklaces were also in great condition and well packaged. If I ever need anything like this again, I will definitely order here, and I’m so recommending this place to my friends. Ordered the Bucky Barnes dog tags for my daughter. Shipping was very fast and my daughter is really happy with them very good experience. Super authentic! Couldn’t ask for anything better, The real deal for sure. I feel like Bucky game me a pair of his own tags! I love these items! They are just as described and came in way sooner than expected. I would gladly recommend this seller! Quick and easy to order. The tags are perfect, no issues whatsoever. + they only took 10 days to arrive here in Germany! Bought these as a Christmas gift for myself along with the Steve Rogers/Captain America ones for my sister. I love them (and I know she’ll love hers)! 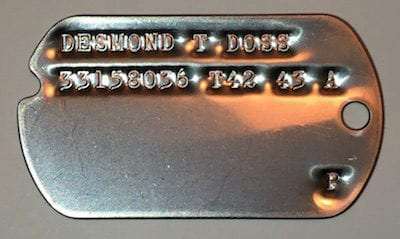 I was looking for authentic dog tags for Steve Rogers for a while after seeing a modern-day set, then stumbled on this site and what I found was perfect! Saw they had Bucky’s and was even happier. They look good, they’re a great price, and I’ll definitely recommend them to my fellow Marvel fans. I was just doing some online research when I came across this site for the dog tags. When I saw they had tags for Bucky Barnes, I didn’t hesitate and ordered them immediately!! They came so quickly, and I was impressed with the packaging. They weren’t just tossed in the envelope, but held securely inside. A lot of thought went into this, very impressed by everything. very happy with the dog tags! also very fast shipping. Would buy again. They arrived today and I’m so happy with them!! They’re perfect, not to mention the shipping that was really fast: I bought them on 6th or 7th April and today is only the 12th. I just had to shorten the chain cause it was too long for me, but overall 100% satisfied!! I couldn’t be happier! The international shipping (Germany) was fairly quick, too. Thank you so much! I absolutely love the dog tag, it is so amazing to the last detail, and I got blown away by the fact that the chain was made from 1944. The staple on the chain bad is a little rusty, I would smell the history. Anyone who loves Captain America and/or Bucky should definitely buy it! 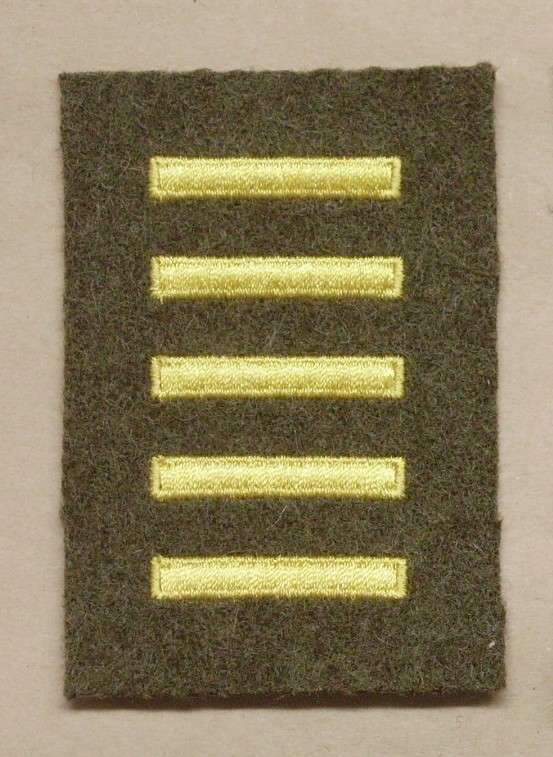 It looks so authentic, I`m gonna wear this all the time, and I want to buy another one or two for collection purposes. But because it was shipped to the Netherlands, and I ordered on New Years` day, so it took in total 21 days to get to me since I paid (16 days for shipping), but it was totally worth the wait. By the way, I told my friends in China, and a lot of people want to buy them too, but there was no shipping option to China. Could you guys maybe consider shipping to China? Anyways, thank you for making this, you guys really made my day! So my second order arrived yesterday which was shipped on 23th! Only five days from the US to the Netherlands! I`m so surprised, and thank you again for adding the shipment option to China! Great Job, my Daughter really loves them. Thanks for all your hard work. I love my tags so much I never take them off! Comfortable and easy to assemble. Aesthetically pleasing. 10/10 would buy again. They look absolutely fantastic, and are better quality than my friend got on Amazon. I can’t wait to use them for my cosplay next year! I absolutely love my new tags! Ever since they came in the mail, I have not taken them off! Bucky Barnes is my favorite character from the marvel universe, and I’m so happy to have something realistic that could have belonged to him!